Next to the seasons, El Nino is the most powerful force driving global weather. Find out what scientists are learning about this mysterious weather phenomenon and its reach through space and time. 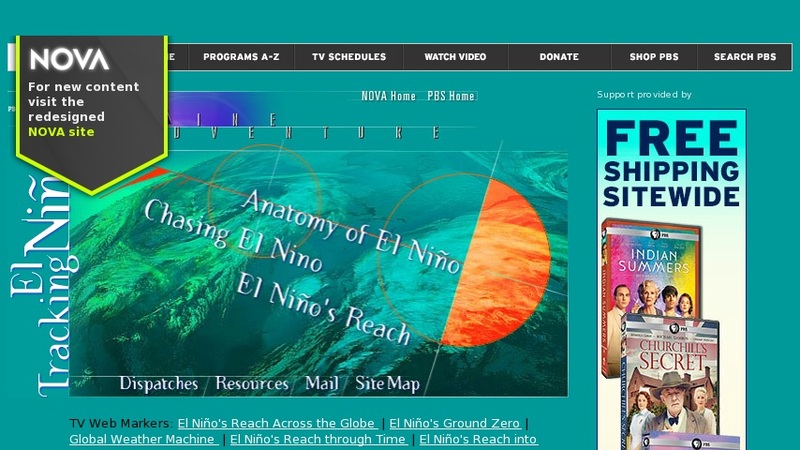 This site is the NOVA Online material on El Nino. It was created in early 1998 during the exceptionally strong El Nino season which began in 1997. Dispatches from writers and scientists are available from early 1998 as well as a scorecard for comparing scientists predictions and the weather that occurred across the globe. Links are maintained to weather sites. A teacher's guide is included with an exercise on weather Forecasting Folklore. The site also gives access to a transcript of the television broadcast of the show.